The year 2000 was a fruitful year for the Ho Leung Ho Lee Foundation. The Foundation held its seventh Award Presentation Ceremony at the Diaoyutai State Guest House on 19 October, handing out a total of 59 awards, namely two Awards of Scientific and Technological Achievement and 57 Awards of Scientific and Technological Progress, to eminent scientists. We the donors were greatly honoured to have Mr Ismail Amat, State Councillor; Mr Ding Shisun, Vice-Chairman of the Standing Committee of the Chinese National People's Congress; and Mr Zhu Guangya, Vice-Chairman of the National Committee of the Chinese People's Political Consultative Conference, preside over the ceremony and would like to express our heartfelt appreciation. It was announced at the Ceremony that the Minor Planet Foundation had approved the naming of an asteroid, discovered in 1978 and numbered 4431 by The Purple Mountain Observatory of the Chinese Academy of Sciences of the People's Republic of China, after the founders of the Ho Leung Ho Lee Foundation, in recognition of the contribution of the Foundation to the promotion of science and technology in mainland China. 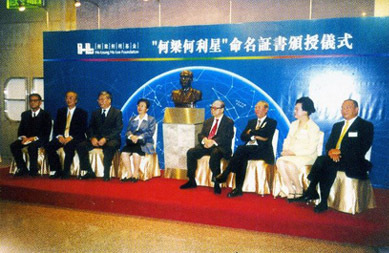 A Naming Certificates and Bronze Plaques Presentation Ceremony for the Ho Leung Ho Lee Star was held at the Penthouse of Hang Seng Bank Headquarters in Hong Kong on 7 November 2000. Ms Zhu Lilan, Minister of Science and Technology of the PRC, and Professor Hui Yongzheng, Chairman of the Foundation's Board of Trustees and former Vice Minister of Science and Technology of the PRC, presented Naming Certificates and Bronze Plaques to the donors. This honour carries special meaning for the donors. Not only does it reflect wide recognition of the work of the Foundation, it also gives great encouragement to our fellow workers.